Where I muse on how it is often the little things that we don’t really pay attention too that makes us the happiest in life, not the big bucks stuff we would expect. How, by slowing down you will start to help and inspire other people to do the same, just by your actions. Part 2: The Key Traits to be Slow in a Fast Environment. About how being slow isn’t about being lazy or slothful (a re-occurring theme) and how disorganisation and mess is “anti-Slow”. 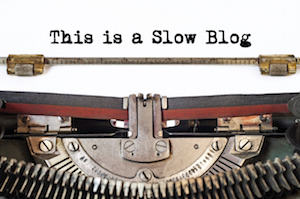 First (and so far only) post in an occasional series praising Slowness. Being rather critical of Twitter. I have been experimenting with it recently here and will post a follow-up entry soon. Part 3: The Podbean Days will be up tomorrow.